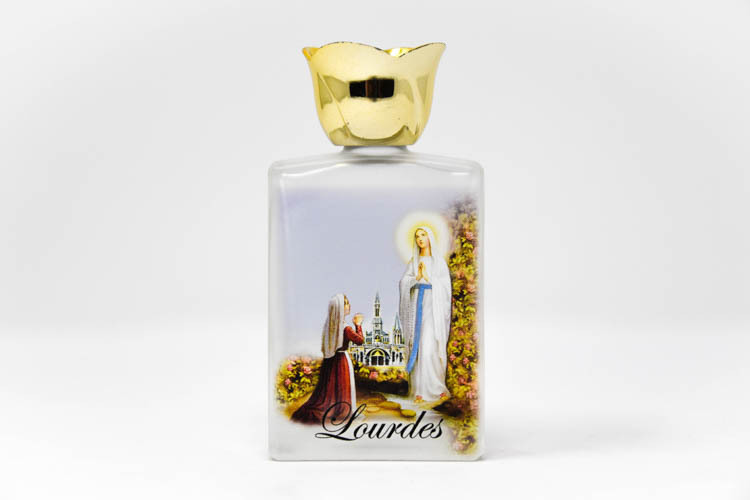 CATHOLIC GIFT SHOP LTD - Lourdes Holy Water in a Colour Glass Square Bottle. Lourdes Holy Water in a Colour Glass Square Bottle. Lourdes water in a square bottle with a colour image on the front of the bottle depicting St Bernadette kneeling to the Virgin Mary. This bottle measures 9 cm tall (3.5 inches) and holds 45ml (1.5 US fl oz) approx. You can be assured that this is genuine Lourdes water is from the grotto.